If you are in the Taupo area around 10am, noon or 2pm you can get to see a truly wondrous spectacle at Aratiatia, about 10km north of the town. It is the escaping rush of ten of millions of litres of water that are released from the Aratiatia Dam and force their way through the narrow gorge below. Authorities open the spill gates from the mighty Waikato River and as it drops quickly down the one jiolometre stretch of gorge it is used to provide hydro-electric power. The best way to appreciate the spectacle is to get there early, find a vantage spot and await a really amazing experience as the waters rush out at up to 90,000 litres a second. There are plenty good spots available - both high up and nearer the waters - and if you have plenty of time then it may even be worth taking along a picnic lunch. 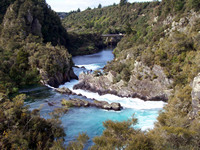 Either before or after the spill you can venture along a two-hour hiking trail between the rapids and the Huka Falls. It is alos excellent for mountainbiking. In summer there is also a spill at 4pm. The Aratiatia Rapids are a superb - and free - exhibition of nature's raw power.